Today is Perfect Picture Book Friday. Before I share another amazing book that has JUST (April 1) hit the shelves…I want to encourage you to hop over to Susanna Leonard Hill’s blog where you will find a wonderful contest for ILLUSTRATORS. Susanna deserves a medal for sure…she just finished reading SEVENTY-NINE fractured fairytales in her March Madness Writing Contest…the voting for the writing contest is over…the winners have been chosen…the prizes have been awarded (I got an honorable mention for Singerella…and won a copy of Linda Ashman’s Nuts and Bolts of Writing Picture Books which I have coveted for quite a while…thank you so much, Susanna!). Another woman who deserves a medal, and who will probably win one for this book, is the author of our Perfect Picture Book choice for today, Laura Purdie Salas. I’m excited that Laura will be the author in the spotlight for the November Will Write for Cookies. What can water do and why is it so important to us? Lovely illustrations and simple yet lyrical text combine magically in this rhyming book for young children. Using language that will invoke vivid imagery in any kid’s mind, the book is a journey into the world of water. • When you can make a non-fiction book engaging, you have a winner! 1. Cover the surface you will be working on with old newspapers. 2. Cut the sponges into interesting shapes. 3. Pour a very small amount of paint into a bowl or even a lid of a discarded margarine container. 4. Wet the sponge in water, wring out and then press into the paint. 5. Now press the sponge onto the page. Sponges create beautiful designs of their own…or you can add strokes from a brush or marker to create trees and flowers for a springtime garden or fish and seaweeds for an underwater aquarium. Sheri is a dear friend, awesome critique buddy and a powerful writer. I’m looking forward to seeing how her year is progressing. 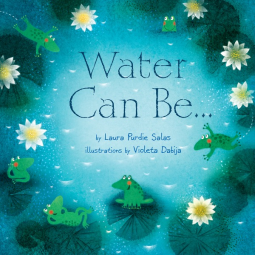 This entry was posted in Perfect Picture Book Friday, Sponge Painting Craft, Water Can Be and tagged Laura Purdie Salas, Perfect Picture Book Friday, picture book review, Springtime Sponge Painting Craft, Susanna Leonard Hill, Violeta Dabija, Water Can Be by viviankirkfield. Bookmark the permalink. Love your post and choice for PPBF, Vivian. Love all the resources and fun things you come up with to do. Must be all that time you spend with your lovely gran-kids. Love, love this art idea with the sponges, makes me want to do it just for the fun of it…. lol. Never mind the kids! Can’t wait to read Laura’s newest book. Such gorgeous illustrations as well. Brilliant! Look forward to reading this beautiful book. I especially enjoy your activities and the sponge painting. Glad you enjoyed the sponge painting suggestion, Pat. 🙂 It looks like it was a hit with everyone…I guess we are just kids at heart! This book certainly deserves two shout outs! So glad Laura is continuing the series! Yes, that is a good tip for us…write a great book…and you can follow it with sequels. 🙂 Glad you enjoyed the review, Joanna! This book sounds so wonderful. And love the sponge-painting activity! Congrats on Singerella’s honorable mention, as well! Thanks for the congrats…I was thrilled…there were so many awesome entries! Susanna’s contests are the best! Great mind think alike. It’s so nice to see Laura getting so many positive reviews. Glad you enjoyed the review, Kirsten. It’s something to keep in mind for when our books are published. 🙂 Book blog tours or just reaching out to people you know who can post a review is a great way to promote a new book. Lovely, and I’m so glad you linked to all Laura’s goodies. She really is so helpful and clever. Yes, she is, Joanne…and those are great tips for all of us as well. I need to revamp my blog and add stuff for parents and kids that can be downloaded. I also love the sponge painting idea. This looks like a lovely book.